With winter comes the holiday season, which I love because it because it brings family and friends together. Ever since I was a kid, this has been such a magical time of year for me. I feel so fortunate to have such a wonderful family to spend the holidays with. My sister is coming home for Christmas this year, which she isn't always able to do, and it will be so special to have her with us. Growing up, my Grandma Mary always outdid herself when it came to Christmas decorations, making Christmas candy, and hosting the festivities, thus earning her the nickname "The Queen of Christmas". When she passed away three years ago, I took over the job making her Christmas candy (stay tuned for recipes). I think that a big part of my love for the holidays is because its the time of year that makes me feel closest to my Grandma. This year is the first year that I have decorated my apartment for the holidays! I was so excited to get started that the tree may have gone up 2 weeks before Thanksgiving... Don't judge! Luckily my roommate loves Christmas as much as I do, and was thrilled when she walked in from work one night and I had turned our space into a holiday wonderland. Today I would like to share with all of you some tips for decorating a small space, and for decorating on a budget. It's no easy to fit a Christmas tree in a small space, which is why I was delighted to find out that they make tall skinny trees that don't take up as much precious real estate in a tiny room. I got my pre-lit tree at Michaels for 40% off which was a great deal. It's on sale for even less on their website now! This one, a less conventional option, and this gorgeous white tree. Less Mess. I am a bit of a neat freak and pine needles dropping all over the carpet would drive me nuts. More environmentally friendly. I can reuse it every year and I am not dumping a cut tree in the landfill. Cheaper. I don't have to buy a new tree each year. Easier to set up and break down. I don't know how I would possibly transport a tree in my tiny car, and getting it upstairs into my apartment is a job I don't wish to undertake. This tree easily disassembles and packs neatly into a box until I'm ready to set it up next year. The right shape and size. It was easy for me to find a custom size that would fit my space well. I can set it up earlier, and don't have to worry about the tree dying before Christmas. I know many people love real trees for their smell, and I'm with you on that one, but there are other ways to infuse that lovely pine smell into your space. Here are a few ideas! Tree Spray... Yes it's a thing! Here is a great option! Stove Simmers. I am dying to try this recipe from A Beautiful Mess! 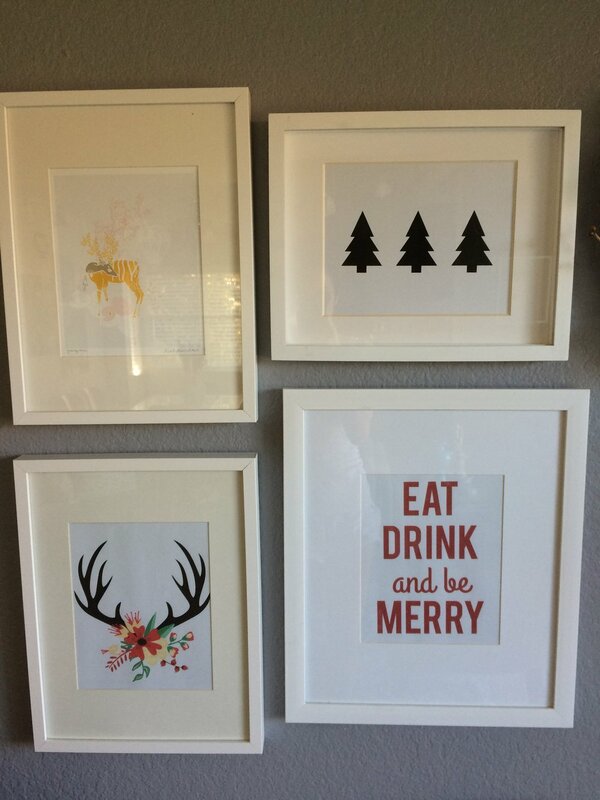 Last year I didn't decorate for Christmas because we had just moved into our new space. I knew that I would want to decorate this year though, so I hit the after Christmas sales on holiday decor. I am so glad that I did! Christmas unfortunately has turned into the ultimate consumer holiday, and the cost of decorating can really add up quickly. Last year I fell in love with some of the woodland style ornaments at Anthropologie, but let's be real... Even on sale after Christmas the prices were still much higher than I was willing to pay. I found very similar options at World Market and Pier 1, and paid anywhere from $1-$4 per ornament. See those snowflake ornaments? I made those out of cheap wood ornaments from Michaels that were $1 each! I painted them with craft paint and then covered them in rhinestones. Luckily as a dance teacher I always have plenty of rhinestones on hand. Having a smaller tree also means that you need less ornaments. I probably have around 10-12 ornaments total on my tree. Tree skirts can be expensive (at least the pretty ones are), so I decided to get creative and use a pretty throw blanket instead. The cats love curling up on it, it goes well with the whole cozy woodland theme, and it was free! I had some yarn left over from another project, and I decided to get creative instead of waste it. This DIY is super simple. Chunky yarn definitely works best. Just string your tassels on a long piece of yarn and you are done! Here is a tutorial on how to make a tassel if you haven't done it before. I also added a wreath to the gallery wall (which I made a couple years ago). Its a super easy DIY project. I just got a plain branch wreath from Michaels, glued on silk orchids, and wrapped a beaded wire garland around it. Yarn: I used three colors of chunky yarn because I wanted the striped look, but you can use as many or as few as you like. You will have leftover yarn if you buy multiple skeins, which is why I decided to make the tassel garland. Decide which size is going to be your front. 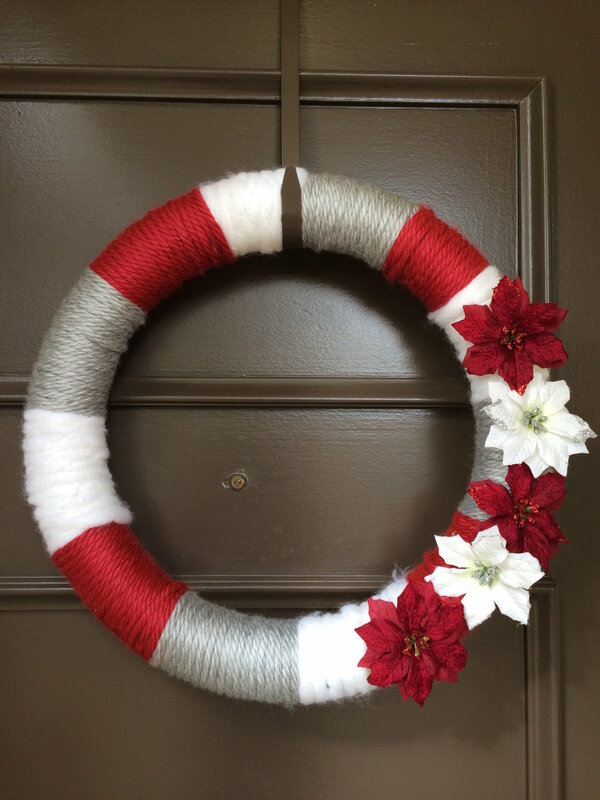 You want to make sure that you are glueing all of your yarn on the back side of your wreath. Start by glueing your first color of yarn, and tightly wind it until you get the length of strip that you want. Cut yarn and glue end to the back of your wreath. Repeat Step 2 until your entire wreath is covered in yarn. Glue poinsettias onto the front of your wreath (you could also use pinecones or any other ornamentation you like). Think outside the box. Flat ornaments can be used as decorations for places other than the tree! I had fun mixing them in with the artwork on my walls. The last ornament is another wooden one from Michaels that I painted and rhinestoned. Lights are one of the best parts of holiday decorating, so why not add some festive lighting to your interiors other than the tree? I found these retro style signs on sale at Michaels. They are battery powered which is great because you can hang them anywhere. I hope everyone is enjoying the start of the Holiday Season! Happy Hanukkah to my family and those of you celebrating this week! I've got to get my menorah out of storage... Have a lovely weekend everyone!